Atlanta is our home. And although our priority is making transit a reliable choice for our riders, we want to give back to the community in whatever way we can. That means serving alongside local nonprofits and donating funds and volunteering hours to various causes. Take a look at a few of the ways we invest in our city. To reach out into the community, both local and abroad, through outreach programs and community service organizations and provide assistance to persons, families, and employees in need of assistance. For over 30 years, the Metropolitan Atlanta Rapid Transit Authority has served the community; not only through transportation and environmental challenges but also through community and charitable efforts. The Employees Charity Club has raised an estimated $600,000 annually from both employee donations and volunteer efforts, making MARTA employees one of the Atlanta's major contributors for both Atlanta and surrounding communities. MARTA’s Employees Charity Club is responsible for linking employees to non-profit organizations and resources that provide goods and services to the socio-economically disadvantaged. The Employees Charity Club prides itself in providing the metro Atlanta community with over 6,000 hours of community service through food and shelter initiatives. Together, the Charity Club and MARTA employees can make a tremendous impact on the needs of the communities we serve. Contact a Charity Club representative to learn of fund-raising and different volunteer opportunities. 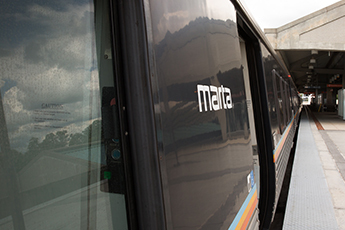 We've made MARTA a driving force behind Atlanta's economic development. Through initiatives like our Transit Oriented Development program, we boost economic growth and quality of life in the areas surrounding our MARTA stations. These "live-work-play" communities place business, entertainment and living spaces all within walking distance of MARTA's rail system. As Atlanta's leading public transit authority, we take pride in our sustainability initiatives — not just because they help preserve Atlanta but because they are a leading influence in our city. MARTA Green Light is our way of working on and off MARTA to promote a cleaner, greener Atlanta.